The sensitivity of the protection circuit can be decreased to prevent this tiresome on-off-on routine – just ask your distributor. When it did start singing, I was impressed by how commanding, and yet graceful it sounded, although I initially felt the amp lacked the depth of stage I’m used to, with some detail slightly veiled. I did bear in mind that the review unit hardly had any run-in time with the distributor. The twin displays – indicating selected input and volume level – and the logo on the fascia emit an ethereal blue glow when the amp is powered up. Those who find this distracting will be glad to know the displays can be dimmed in stages (but not the logo) and switched off altogether. Build quality and cosmetics are exemplary – clearly, no compromise was made in the finish and fittings (although the conical aluminium feet of ModWright’s power amps look cooler). Specs: This Mosfet design outputs 200W per channel into 8 ohms and 400W into 4 ohms). The KWI 200 has a comfortable 34dB of gain, while the substantial 1.5kVA transformer ensures there’s no shortage of juice on tap. Three pairs of RCA inputs and a pair of XRL inputs as well are provided, but note that the KWI 200 is single-ended. There is a Home Theater Bypass, and the amp can be used solely as a preamp or power amp. 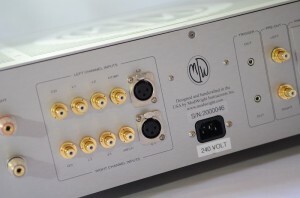 Options include Phono (MM/MC) and DAC (with USB) – these were not included in the standard unit to keep the price at a particular point, without compromise. Two pairs of speaker terminals are provided, if bi-wiring is your game, as is a plasticky remote handset to control volume and select inputs. The silver-finish amp measures 445 x 307 x 160mm (w/d/h), quite deep as you will note, and weights 25kg – not the kind of mass I would like to shift too often! 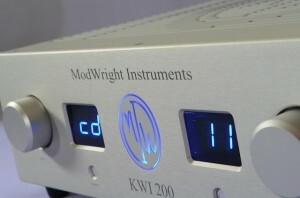 Performance: This isn’t my first run-in with ModWright amplification, having reviewed the KWA 150 SE with the LS 100 tube preamp for another site more than a year ago. They were solid performers in tandem, although I recall being more impressed with the LS 100 when it drove my own power amps. I was expecting some elements of the power section of the KWI 200 to sound familiar, although this time it was being driven by a solid-state preamp signal. I’ve been somewhat spoilt by the results I get from the solid-state amplification in my system, so the KWI 200 had much to live up to in all areas. I’m glad to report that it gave a mostly sterling account of itself throughout the time I had it in my system. As the weeks progressed, the slightly veiled nature I had observed initially made way for a more transparent sound, the mid and upper registers opening up to reveal more detail in the nature of the recording. What I was already hearing from my own pre-power amps, the KWI 200 did not miss out on, and its rendering of separation between various elements in the recording was commendable. At no time – even from start – was there any suggestion of harshness or grain. I will not use the term “tube-like” because for some, and justifiably so, this indicates a degree of tonal coloration. The KWI 200 is simply very organic and honest in its delivery, lending little or no tonal deviation to the source, and very fluid and cohesive in its rhythmic flow. This is certainly is a very smooth and musical amp, its drive enhanced by a well rounded – if a tad over-controlled – bass. I have no complaints about its grunt – it has slam but not in heavy-handed way. Rather, the “iron-fist-in-velvet glove” approach is a more apt description of how the KWI 200 handles dynamic passages and transients. Some will tag this latter quality as a slight lack of bite with more aggressive recordings, but if you’re not on a constant diet of rock, this is negligible. Feed the amp other types of music and the level of realism in its delivery is gripping – for me, there was absolutely no fatigue even after long hours of listening. Low level detail was very good, and when pushed hard, as with driving my Maggies, the KWI 200 showed no indication of running out of breath even with complex recordings. Layering of detail, separation of instruments and projection of vocals were all impeccable – these, it presented with all the finesse of a capable system of separate components. The good: I liked its looks and unfussy sound, and the convenience of the remote for switching inputs and powering up/off (a luxury my preamp doesn’t allow me). The KWI 200 is a very capable and well thought out amp overall, efficiently doing its work no matter the load or music, and well-protected from any sort of calamity. Those wanting to step up from their entry- or mid-level integrated amps but without wading into pre-power territory will find both convenience and high-end sound to be had from this big fella. The phono and DAC options encourage a long-term commitment. The ungood: The protection system is a wee bit too sensitive, although it can be sorted out by the distributor. The amp’s physical dimensions and weight mean you want to install it and not move it ever – you might want to add the options right from the start! I would have liked to hear a bit more depth in the stage and wallop in the bass, and some more bite with, say, electric guitars. The provided power cord seems a bit of an afterthought for an amp of this magnitude, if you’re a believer in the power of, er, specialist power cords. I reckon a majority of punters will upgrade this cord. Final verdict: If you’re going to spend around US$5k for an integrated amp, you want it to sound AND look good, a feat the KWI 200 pulls off easily. Still, this price sector is not an area where any one name or configuration can dominate. Those who still want to take the pre-power route will undoubtedly find some fine combinations at the price that allow perhaps a deeper insight into the music, or have more impressive bass or high registers that possess more sparkle. 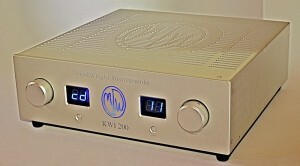 Have no doubt, though, that the KWI 200 is no lightweight, physically or sonically. There’s great promise and potential here (as in a better power cord and feet) for those who invest in this amp – a firm recommendation is warranted.